The John F. Kennedy Presidential Library and Museum has launched a new website to celebrate the 40th anniversary of the first moon landing and President Kennedy’s grand vision that made that achievement possible. 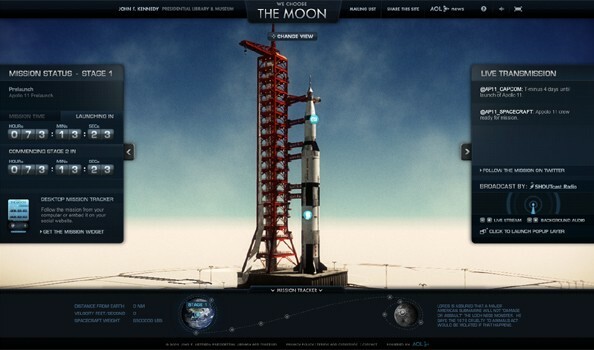 The goal of the site is to allow visitors to experience the Apollo 11 mission in real time, utilizing archival photographs, video, audio and "real time" transmissions. The site is really well done and a wonderful way for children (and adults) to experience this moment in history. The site is live now, with the launch of Apollo 11 scheduled for July 16 at 9:32 am (EST), exactly forty years after the first launch. There will real time updates throughout the mission, which you can even receive on the website or via Facebook, MySpace and Twitter.